This weekend, I am trying to concentrate on poetry-wrestling, herding poems, culling and grooming and all that. So–less time to reflect on writing my own blog posts. However! I follow many poets and writers, and one or two philosophy and science blogs, would like to direct my readers to two writers who responded to Mary Oliver’s recent death--both of these poets commented on Oliver’s reputation as a nature writer and a poet of “joy.” Reputation isn’t the same as analysis. Here is Grant Clauser, wondering whether it will be possible for him to write gladness into his observations (which are quite keen and worth reading). And here is Catherine Pierce, a poet much younger than I who admits to her own prejudices when deciding which poets to read–which poets are “worth the effort” of reading (ie, which writers teach us most about life and about poetry-writing). The death of a beloved animal companion some years ago took me to Oliver then. And in the sorrow, I recalled the gladness of having that dog in my life. 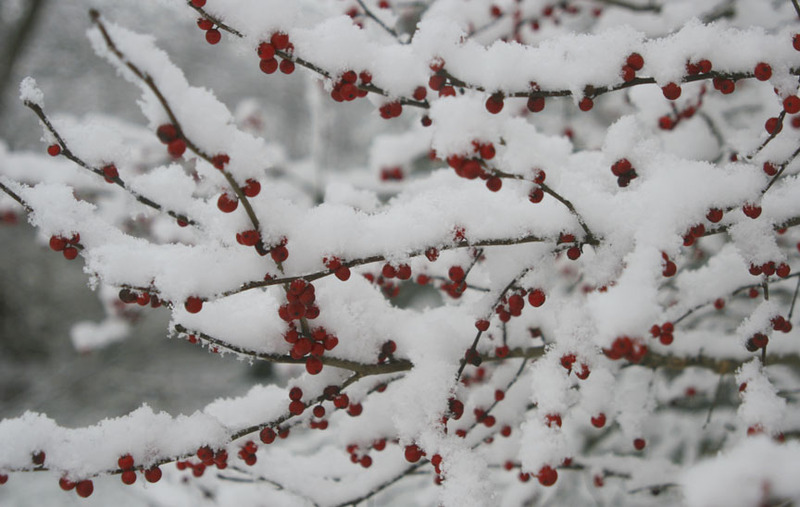 Temperate regions in zones 5 and 6 benefit from snow cover, which moistens soil as it melts and insulates the living things that depend upon soil–a cold “open” winter is particularly hard on plants. 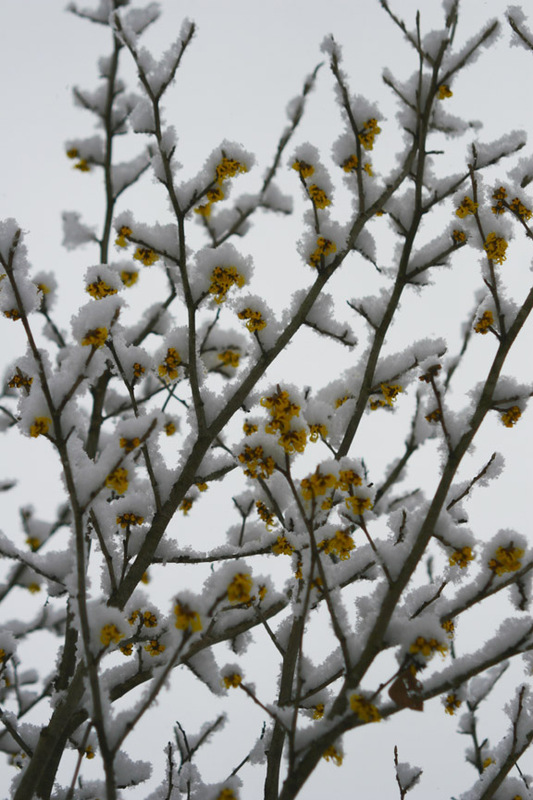 Except for an unusual late-autumn blizzard, this season has been mild; so I welcome today’s snow even as signs of spring become visible: a few blooms on the hazel boughs, some snowdrops, reddening stems in the hedgerow shrubs. Winterberries are beginning to shrivel, and soon bluebirds and the earliest robins will pick them off for sustenance before the grubs and insects are plentiful. Today, as winter gently asserts itself, there are revelations in the outlines of white against shadow. The squirrel dreys are visible, loaded with dollops of snow, amid treetops. The deer paths and deer beds are more obvious because those areas are flattened by use and thus blanketed more evenly than the surrounding grassy spots. Meadow’s stalks droop in criss-crossed patterns. If I look closely enough, I can identify the species, dry and broken, tangled together and covered in snow: solidago, eupatoria, aster, clematis, ryegrass, penstemon, milkweed. 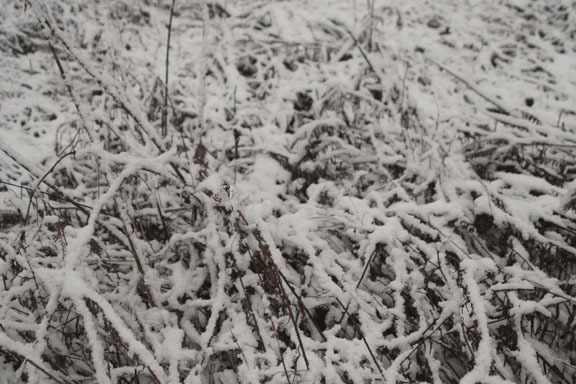 The snow’s ephemeral, yet I find myself thinking of Steve Tobin’s Earth Bronzes. 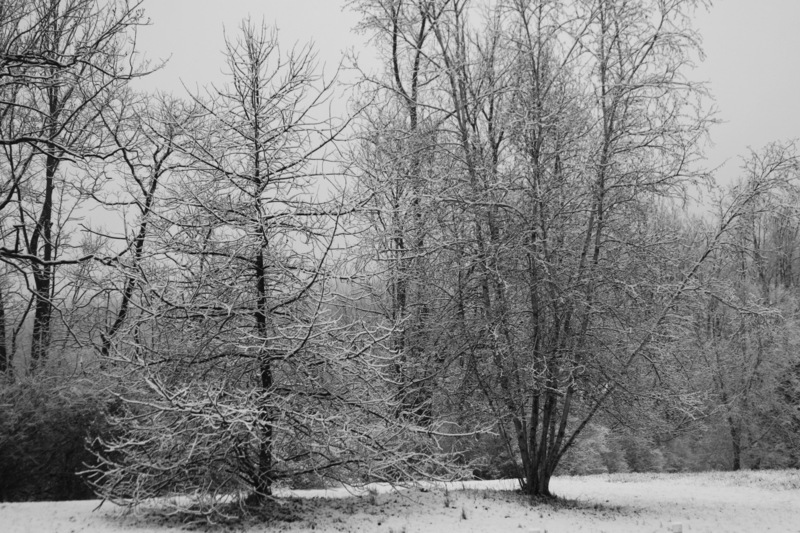 Overhead, vines rope trees together, creepers that take on a creepy mien, ghostly and dripping, when snow-covered. Vines have become a hazard in our region, with both native varieties (poinon ivy, wild grape) and non-natives (too many to name!) choking wooded areas, killing off tree crowns, usurping the niches of native plants, and adding to the hazards of storm damage. 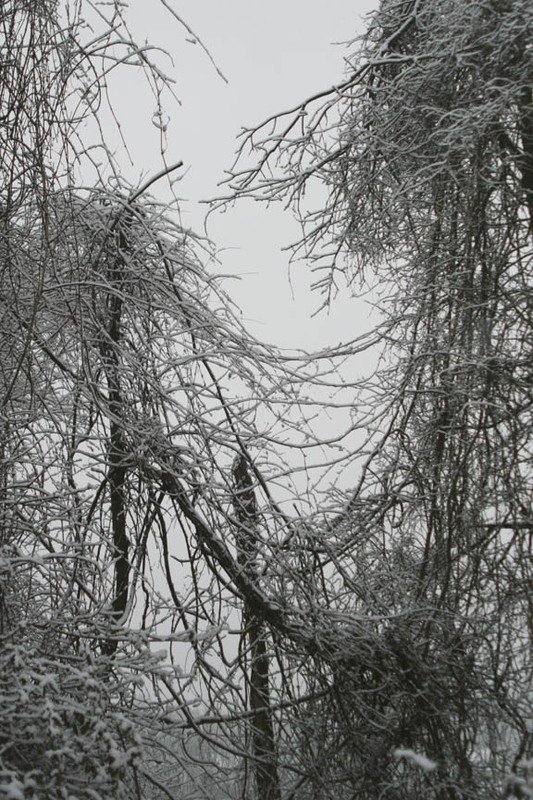 Maybe that is why the ice-draped vines appear sinister to me. And yet. A plant is neutral, alive, neither good nor bad, possesses no conscience, cannot be evil, plays its role in the environment–and can serve as inspiration. 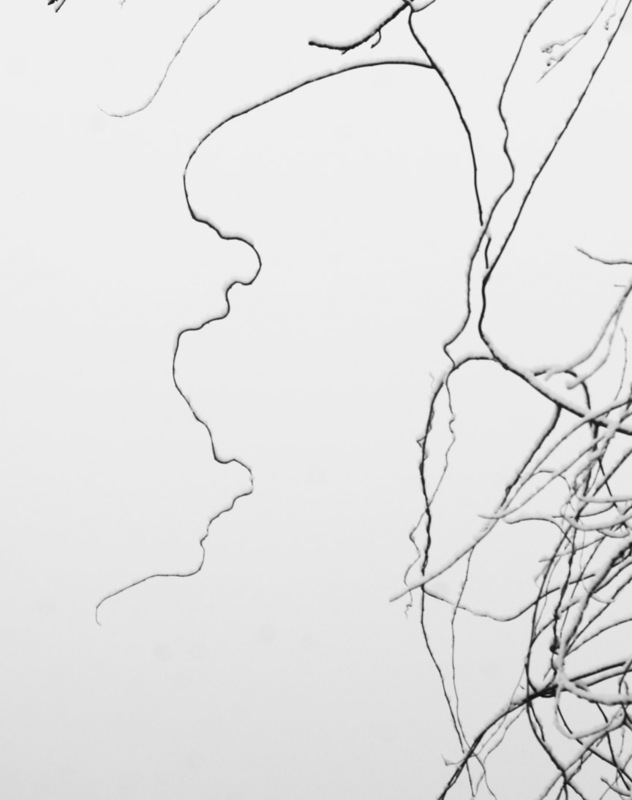 One woody tendril sways high above the ground, a line drawn against the featureless sky. Using a stick, I copy its shape in the snow at my feet. It might be part of an alphabet I do not know, an ideogram I have yet to decipher, the course of a river. Imagination steers from that point on: I take up my pen and write. As in my work, her poetry often centers on images and inspirations that visit while walking, weeding, sowing, and so forth. So it was a simple and sensible question. Generally, I keep a small journal and a pen nearby when I work. There’s a porch swing near my garden gate, and often I keep my writing tools as well as my gardening tools on the swing. But today I forgot. I was drawn to the vegetable garden by a break in the soggy weather, a glorious day before first frost, zinnias and marigolds still in bloom and all the weeds going riotously to seed. I pulled up undesirable annual grasses, polygonum, crabgrass and queen-anne’s-lace, wild asters, elderberry stalks, and vines along the edge of the fence. I’m fond of goldenrod and chicory in the meadow, but they make poor companions for asparagus; out they went. A northern mockingbird heading south stopped to perch among the walnuts trees and trilled as cheerily as it would have done in spring. And I had ideas. And I forgot to write them down. I cannot recreate that pleasant hour now, but the time spent among the weeds and the late bees and the big spiders catching their last prey and hanging their egg sacs in possibly-safe places while the hawks cry high overhead is comforting and inexpressibly valuable to me. But being in the world—what we tend to call “the natural world”—keeps me from becoming too worldly. Keeps me attuned to the gift of poetry, and keeps me from becoming too human (too rational) for comfort.